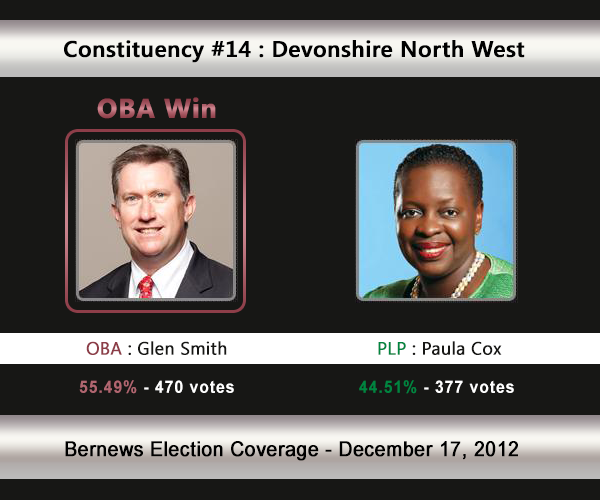 [UPDATE Dec 17: Election Results] Glenn Smith [OBA] has defeated the incumbent Paula Cox [PLP] in C#14 Devonshire North West. The OBA pick up a very big seat, ousting the sitting Premier. The incumbent is the PLP’s Paula Cox — who serves as Premier — and she will be challenged by the OBA’s Glen Smith. Ms Cox has held the seat for 16 years – winning it in a 1996 bye-election. In the 2007 General Election, Ms Cox won 69.59% of the vote vs the UBP’s Alan Marshall [492-215]. In 2003, Ms Cox won 74.27% of the vote against Christian Dunleavy [UBP] who received 25.73%. 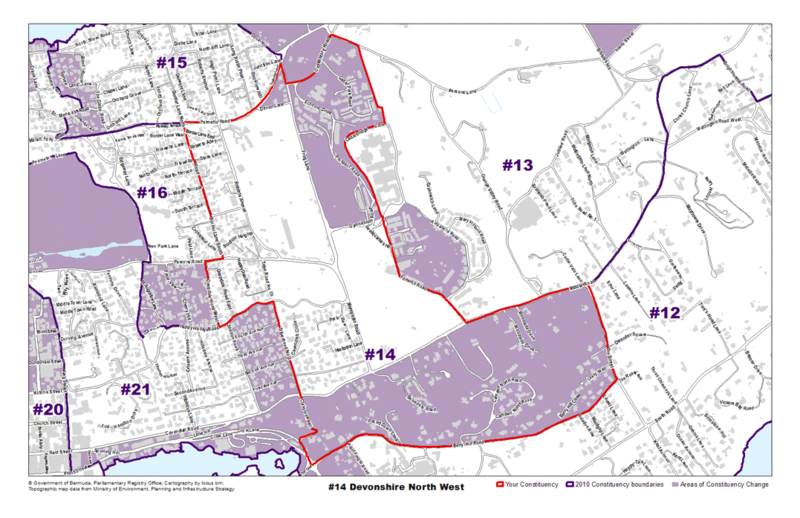 Areas the Devonshire North West constituency consist of, or is located by include Palmetto Road, Devon Lane, Frog Lane, Gymnasium Road, Cedarbridge Lane, Fort Hill Road, Cavendish Road, Shelton Road, Happy Valley Road, Curving Avenue, St. Augustine Road, Parsons Road, Friswells Road, Border Lane North and more. Hon. Paula A. Cox was elected as Party Leader at the Annual Delegates Conference on October 28, 2010. She was subsequently sworn in as Premier of Bermuda and Minister of Finance. Premier Cox has gained respect across party lines and internationally. For several years in succession she was deemed by the Bermudian Magazine the most effective politician in her various portfolios of Labour, Home Affairs and Public Safety, Education and Finance. Premier Cox is the recipient of its 2011 Regional Woman of The Year Award which will be presented during the Women’s Empowerment Summit 2011. She is married to Cameroon businessman- Mr. Germain Nkeuleu. Glen Smith grew up on Middle Road, Devonshire, opposite the Arboretum, and has lived in Constituency 14 for his entire life. Thought to be a slow learner in school, the Reading Clinic diagnosed Glen as suffering from dyslexia. His mother worked two jobs to support the family and make sure that he got the best guidance and education possible. With hard work, Glen overcame those early challenges to become a seasoned entrepreneur launching and operating 10 businesses and creating over 250 jobs. His first entrepreneurial venture was a horse and carriage business. Glen’s other businesses have included ZipX, International Bonded Couriers (IBC), Invisible Fencing Bermuda Ltd., Invisible Trenching Bermuda Ltd. and Island Self Storage Ltd. where he currently serves as CEO. As a parent with two teenage boys, Glen understands the challenges facing both parents and young people in today’s Bermuda – and believes that improving our public education system holds the key to success. “An unnecessarily high percentage of the inmates in Bermuda suffer from dyslexia or attention deficit disorder,” he says. “Conditions that could have been treated early in their lives. Our education system must be improved so that it doesn’t leave people behind, and instead provides treatment so that our most vulnerable students receive the support they need to have a brighter and more productive future. We need to incorporate a technical and vocational curriculum beginning in middle school – and we should also consider a longer school day to provide more time for sports, music, art and other activities. Glen has combined his business experience with a lifetime of public service – including sitting on boards with Somersfield Academy, The Reading Clinic, and The Family Centre. He served as Deputy Mayor, Alderman and Common Councillor with the Corporation of Hamilton from 2008-2012.